Introduction: The frequency and distribution of dystrophin gene deletions vary in patients with Duchene/Becker muscular dystrophy (DMD/BMD). Objective: In this study, we aimed to analyze clinical, biochemical, and dystrophin gene deletion pattern, by using multiplex polymerase chain reaction (PCR) in the population of eastern Uttar Pradesh and the adjoining districts of Bihar and Madhya Pradesh. Material and Method: After clinical assessment, 225 patients of DMD/BMD were analyzed for deletion in dystrophin gene. Clinical features and biochemical parameters were noted. For genetic study, all samples were tested for deletion from 25 exons of DMD gene by using multiplex PCR. 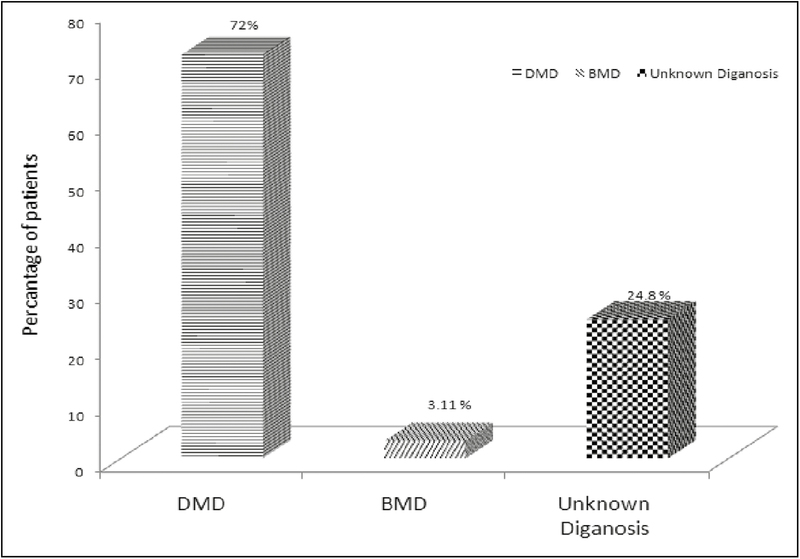 Result: Deletions were detected in 169 (75.1%) patients of DMD/BMD. Deletions were observed in both proximal and mid-distal hot spot regions with maximum deletion localized in the mid-distal hot spot region of the gene. 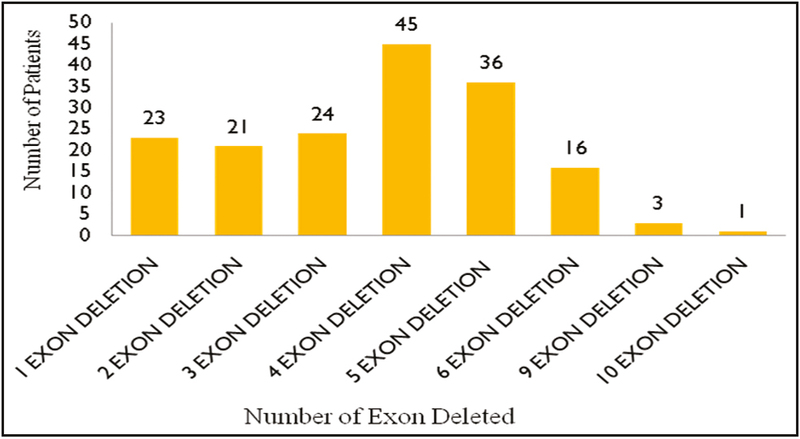 The most frequent deletions were observed in exon 50 (14.9%) and exon 49 (10.8%). Conclusion: This study concludes that mid-distal region of dystrophin is highly polymorphic in the population of eastern Uttar Pradesh and responsible for pathogenesis of DMD. The population of eastern Uttar Pradesh shows similar pattern of deletion in dystrophin gene when compared with other ethnic groups of the Indian population. Dystrophin gene deletion is the main leading cause of X-linked recessive neuromuscular disorder Duchenne muscular dystrophy (DMD) and its allelic form Becker muscular dystrophy (BMD). The incidence ratio of DMD is 1 in 3,500 and BMD is 1 in 18,000 male births., DMD is characterized by muscle weakness, calf hypertrophy, and Gower’s sign. Dystrophin is the largest gene that spans more than 2.5 billion base pairs, which consists of 79 exons. Deletion of exons is nonrandomly distributed in specific hot spot areas of the gene. These hot spot areas are divided into two regions: (1) proximal hot spot region, which contains exons 1–19 and leads to about 20% of the deletions in this area, and (2) mid-distal hot spot region, which covers exons 42–55 and leads to approximately 80% of deletions in this region., Due to the deletion in the gene, it leads to shift in reading frame (out of frame) and results in very low production of functional dystrophin protein, and subsequently results in severe form of DMD phenotype. In BMD, reading frame is preserved (in frame) and that leads to the production of semi-functional protein. Due to altered protein, muscle degradation occurs and it leads to destruction of muscle proteins such as creatine kinase. Overall, approximately 65% large-scale deletions, 5% duplications, and 30% point mutations conform to the reading frame. Due to the bigger size of gene and highly polymorphic nature of deletions, direct sequencing of gene is very expensive. Yet several techniques are discovered for detection of mutation in the gene. Multiplex polymerase chain reaction (MPCR) is one of the cost-effective and highly specific techniques for the detection of large gene deletions. Recently, multiplex ligation-dependent probe amplification (MLPA) method is also used to detect deletion and duplication as well as distribution and extent of deletion and duplication in the DMD gene. This study has been undertaken to evaluate the types and distributions of deletions, clinical, and biochemical parameters in patients of DMD/BMD in the population of eastern Uttar Pradesh by using MPCR assays. After deletion analysis, we compared our study with the other ethnic groups of the Indian population. A total of 225 patients who were clinically confirmed or suspected for DMD/BMD were recruited from the outpatient department of neurology of Sir Sunderlal Hospital Institute of Medical Sciences, Banaras Hindu University, Varanasi, Uttar Pradesh, India, which provides health services to the population of eastern Uttar Pradesh, Bihar, Jharkhand, Chhattisgarh, and the adjoining districts of Uttar Pradesh. Detailed clinical evaluation was noted by clinicians regarding the age of onset, family history, and strength of muscle. We also evaluated some blood parameters such as creatine phosphokinase (CPK) level, and lactate dehydrogenase (LDH) level, and electromyography (EMG) data for strengthening the clinical evaluation. Blood samples from the patients were collected in ethylenediaminetetraacetic acid–coated vials after obtaining informed consent from the patients and/or their parents in case of minors. Genomic DNA was extracted by using the standard method, which includes slight changes according to the standardization in the laboratory. Genomic DNA was quantified to check the quality and quantity of DNA (Nanodrop Spectrophotometer; BioTeK, Winooski, Vermont USA). MPCR method was performed as per the study by Chamberlain et al., modified by Beggs et al. and Sinha et al.. For dystrophin gene deletion analysis, primers of promoter and 24 exons were designed for DMD gene that was highly polymorphic in nature. To facilitate our result, we combined the primers into five primer set or groups (described in [Table 1]): group 1 included exons 53, 47, 42, and 60; group 2 included exons 45, 48, 49, 43, and 44; group 3 included promoter, exons 19, 3, 8, and 13; group 4 included 51, 50, 6, 21, and 55; and group 5 included 17, 4, 46, and 34. Exon 52 and exon 12 were run separately. The MPCR conditions included initial denaturation at 94°C for 7min, denaturation at 94°C for 30s, annealing at 52°C for 30s, extension at 65°C for 4min, and final extension at 65°C for 7min followed by 24 cycles. 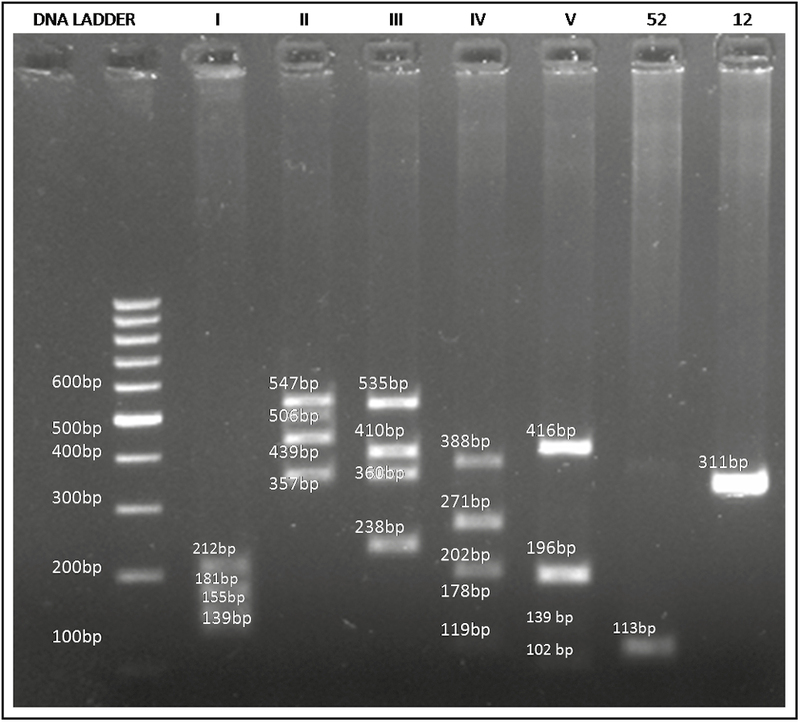 After MPCR, PCR products were analyzed using standard agarose gel electrophoresis (3% agarose gel) and visualized under ultraviolet transilluminator (Bio-Rad Mumbai, India). Deleted exons that were not amplified were reconfirmed by using a single-reaction PCR. Of the total 225 samples of patients, 169 showed deletion in exons of DMD gene, of which 162 samples were diagnosed with DMD and 7 were diagnosed clinically with BMD. Fifty-six samples that did not show any deletions in 24 exons were categorized under unknown diagnosis [Figure 1]. The deletion pattern for the multiplex set is illustrated in agarose gel loaded with PCR products [Figure 2]. Amplified products represent the presence of exon in DMD gene and missing bands represent deletion of that exon in DMD gene. As shown in [Figure 2], deletion of exon 44 was reported because exon 44 was not amplified in that patient. Deletion was confirmed by running (twice) single reaction of PCR for deleted exon. Similar results were obtained in other patients also. 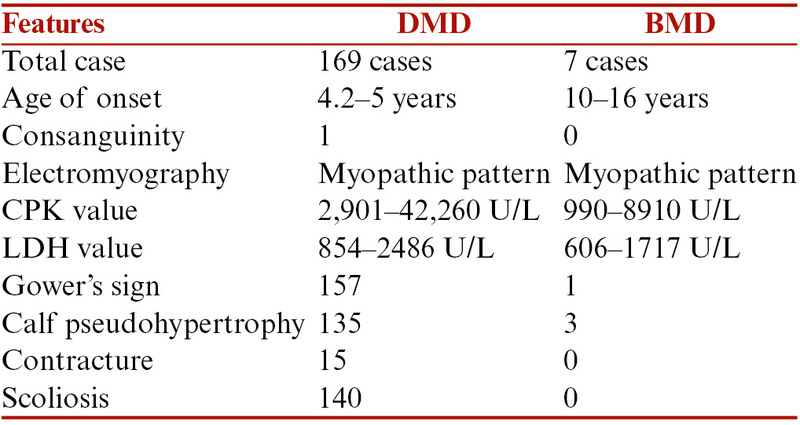 Clinical and biochemical indices of the patients with DMD and BMD are shown in [Table 2]. To determine physical disability, we used a Gardner–Medwin and Walton Scale that has been previously assigned to each patients: grade 0, all normal activities and hyperCKemia; grade 1, normal gait, unable to run freely; grade 2, abnormal gait; grade 3, muscle weakness, climbing stairs with support; grade 4, positive Gower’s sign; grade 5, unable to rise from floor; grade 6, unable to climb stairs; grade 7, unable to get up from chairs; grade 8, unable to walk independently; and grade 9, unable to eat, drink, or sit without support. Gower’s sign and calf hypertrophy were reported in majority of cases. Maximum cases presented with complaint of lower limb muscle weakness. In [Figure 3] and [Figure 4], clinical and biochemical data of few samples explained the basis on which these samples had been selected for DMD gene deletion analysis. Patients A-1 and B-1 represent lower limb weakness because of which the patient was unable to stand without support. A-2 represents the back side of the patient showing muscle weakness. Serum CPK of Patient A was 46,556 U/L and value of LDH was 7,634 U/L. In Patient A, exons 46–55 of dystrophin gene were deleted. In case of Patient B, value of CPK was 11,632.5 U/L and exons 49 and 50 were deleted. Patients C and D represent winging of scapula and calf hypertrophy. Serum CPK level of Patient C was 25,678 U/L and that of Patient D was 17,289 U/L. Exons 12, 13, and 17 were deleted in Patient C, and exons 49, 50, and 51 were deleted in Patient D. Patient D was a familial case, his maternal uncle was also diagnosed with DMD. In Patient E, serum CPK level was 16,563 U/L and LDH level was 513 U/L, and exon 51 was deleted in gene deletion analysis. Patient F represents scoliosis; his serum CPK level was 17,240 U/L and exons 48–51 were deleted. Patient G represents BMD sample; his CPK level was 6654.6 U/L and LDH level was 595 U/L. In this patient, exons 6, 13, and 43 were deleted. After MPCR, deletions were detected in 169 patients (75.1%); among these, 23 patients (13.6%) had single exon deletions and 146 patients had more than one deletion (range, 2–10). Twenty-one patients (12.4%) had two exon deletions, 24 (14.2%) had three deletions, 45 (26.6%) had four deletions, 36 (21.3%) had five deletions, 16 had (9.42%) six deletions, 3 (1.77%) had nine deletions, and 1 (0.59%) had ten exon deletions [Figure 5]. The most frequently deleted exons were 50 and 49. No deletion was detected on exon of promoter. 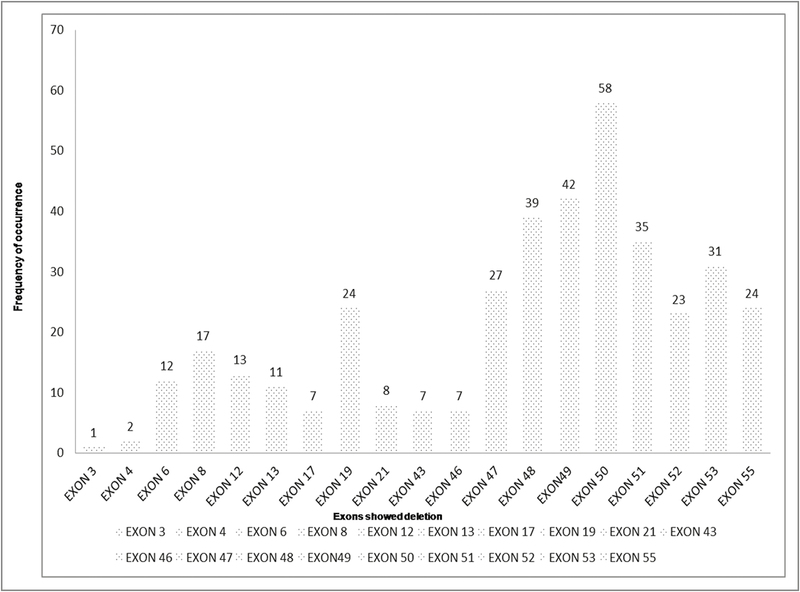 Approximately 75.5% of all deletions were located on exons 42–52 in mid-distal hot spot region [Figure 6]. In case of BMD, 6 patients reported deletion in exons 42–52 in the mid-distal hot spot region, whereas 1 showed deletion in the proximal hot spot region. DMD and BMD are the most common X-linked inherited neurological disorders. Mapping data and molecular genetics study indicate that both forms are the result of mutation in gene that encodes for the protein dystrophin. Various methods have been used in various laboratories to assess deletion in the dystrophin gene. Before the genetic study was developed, DMD was diagnosed by clinical features and various biochemical methods such as serum CPK levels, LDH levels, and EMG data. Skeletal muscular biopsy and Western blotting were applied in several laboratories. Few laboratories used southern blotting, but this method is difficult and time-consuming, and further, it did not provide data of deletion and duplication of gene and in determining effect of mutation on reading frame. Beggs et al. first developed method MPCR that was cheaper and faster than southern blotting, but this method was applied only to identify deletions in gene. QPCR (quantitative PCR) is another method to determine gene dosage in carrier testing. The most suitable method to detect both deletion and duplication is MLPA technique, which now replaces MPCR by detecting the extent and distribution of deletion and duplication and by facilitating genotype and phenotype correlation. In our study, by using multiple PCR, we detected intragenic deletions in 169 individuals (75.11%) (DMD/BMD). No deletion of the promoter region was found. Fifty-six samples (24.88%) that did not show deletion in dystrophin gene were diagnosed for muscular dystrophy only on the basis of clinical findings such as Gower’s sign, lumber sign, calf hypertrophy, biochemical data, and EMG reports. On the basis of our mentioned data, these samples were selected for gene deletion analysis but deletion was not reported for 24 exons in these 56 samples. These 56 cohorts may belong to gamma-sarcoglycanopathy because autosomal-recessive limb girdle muscular dystrophy 2C clinically resembles dystrophinopathy. Further, immunohistochemistry and MLPA tests were suggested for confirming the diagnosis of these samples. In our study, of 169 samples, deletion was reported in both proximal and mid-distal hot spot regions. This study analyzed that maximum deletions were located on exons 42–52 of mid-distal hot spot regions of dystrophin, which code for the rod domain consisting of spectrin-like sequences and play important role in the stability of protein. Very few deletions are reported in proximal hot spot region, which lead, subsequently, to mild disease expression. To evaluate all the existing mutations in the dystrophin gene, they may be subjugated to MLPA; though maximum exons were covered through MPCR method, it does not rule out every mutation in the gene, thus few mutations may have escaped, although clinically, the patients were suspected for DMD/BMD. In such cases, MLPA or direct sequencing can be used. This study helps clinicians in the diagnosis of DMD/BMD among patients, because diagnosis through muscle biopsy is painful and patients are not comfortable with this procedure. There is no genotype-phenotype correlation because severity of disease varies in patients reported for same deletion. So this study supports clinicians to spread awareness regarding genetic disease. In present study maximum cases are familial in nature, in maximum cases maternal uncle of patients are affected with same disorder. Carrier testing is required in these families. Deletion of exons is the most common mutation in dystrophin gene, and MPCR identifies majority of mutations and it is relatively economical for the Indian population. In our study, 25 exons were selected for mutational analysis that is highly polymorphic in nature. In eastern Uttar Pradesh population, maximum deletion was reported in mid-distal hot spot regions of dystrophin and exons 50 and 49 were mostly deleted. For the other negative cases, where deletion is not identified by MPCR, multiplex ligation probe alignment or direct sequencing can be used. After the comparison of our result with the other ethnic groups of Indian population, we can conclude that mid-distal hot spot region is highly responsible for the pathogenesis of DMD and BMD in the Indian population, as our data show that the maximum deletion is reported in mid-distal region of dystrophin. By this study, we suggest researchers to develop drugs specific to exons that code for mid-distal region (exons 42–52). Hoffman EP, Kunkel LM, Angelini C, Clarke A, Johnson M, Harris JB. Improved diagnosis of Becker muscular dystrophy via dystrophin testing. Neurology 1989;13:1011-7. Emery AE. Population frequencies of inherited neuromuscular diseases: a world survey. Neuromuscul Disord 1991;13:19-29. Bushby KM, Thmabyayah M, Gardner MD. Prevalence and incidence of Becker muscular dystrophy. Lancet 1991;13:1022-4. McDonald CM, Abresch RT, Carter GT, Fowler WM Jr, Johnson ER, Kilmer DMD. Profiles of neuromuscular diseases: Becker’s muscular dystrophy. Am J Phys Med Rehabil 1995;13:S93-103. Koenig M, Hoffman EP, Bertelosn CJ, Monaco AP, Feener C, Kunkel LM. Complete cloning of the Duchenne muscular dystrophy (DMD) DNA and preliminary genomic organization of the DMD gene in normal and affected individuals. Cell 1987;13:509-17. Den Dunnen JT, Grootscholten PM, Bakker E, Blonden LA, Ginjaar HB, Wapenaar MC, et al. Topography of the Duchenne muscular dystrophy (DMD) gen. Am J Hum Genet 1989;13:835-47. Monaco AP, Bertlson CJ, Liechti-Gallati S, Moser H, Kunkel LM. An explanation for the phenotypic differences between patients bearing partial deletions of the DMD locus. Genomics 1988;13:90-5. Lai KK, Lo IF, Tong TM, Cheng LY, Lam ST. Detecting exon deletions and duplications of DMD gene using multiple ligation dependent probe amplification (MLPA). Clin Biochem 2006;13:367-72. Grimberg J, Nawoschik S, Belluscio L, McKee R, Turck A, Eisenberg A. A simple and efficient non-organic procedure for the isolation of genomic DNA from blood. Nucleic Acids Res 1989;13:8390. Chamberlain JS, Gibbs RA, Ranier JE, Nguyen PN, Caskey CT. Deletion screening of the Duchenne muscular dystrophy locus via multiplex DNA amplification. Nucleic Acids Res 1988;13:11141-56. Beggs AH, Koenig M, Boyce FM, Kunkel LM. Detection of 98% of DMD/BMD gene deletions by polymerase chain reaction. Hum Genet 1990;13:45-8. Sinha SP, Mittal RD, Mittal B. Detection of gene deletion in patients of Duchenne muscular dystrophy/Becker muscular dystrophy using polymerase chain reaction. Indian J Med Res 1992;13:297-301. Singh V, Sinha S, Mishra S, Chaturvedi LS, Pradhan S, Mittal RD, et al. Proportion and pattern of dystrophin gene deletions in North Indian Duchenne and Becker muscular dystrophy patients. Hum Genet 1997;13:206-8. Mallikarjuna Rao GN, Hussain T, Geetha-Devi N, Jain S, Chandak GR, Ananda Raj MP. Dystrophin gene deletions in South Indian Duchenne muscular dystrophy patients. Indian J Med Sci 2003;13:1-6. Kumari D, Mital A, Gupta M, Goyle S. Deletion analysis of the DMD gene in DMD patients: use in carrier diagnosis. Neurol India 2003;13:223-6. Kohli S, Saxena R, Thomas E, Singh J, Verma IC. Gene changes in Duchenne muscular dystrophy: comparison of multiplex PCR and multiplex ligation-dependent probe amplification techniques. Neurol India 2010;13:852-6. Basak J, Dasgupta UB, Banarjee TK, Senapati AK, Das SK, Mukherjee SC. Analysis of dystrophin gene deletions by multiplex PCR in eastern India. Neurol India 2006;13:310-1. Dastur RS, Gaitonde PS, Khadilkar SV, Nadkarni JJ. Becker muscular dystrophy in Indian patients: analysis of dystrophin gene deletion patterns. Neurol India 2008;13:374-8. Swaminathan B, Shubha GN, Shubha D, Murthy AR, Kiran Kumar HB, Shylashree S, et al. Duchenne muscular dystrophy: a clinical, histopathological and genetic study at a neurology tertiary care center in southern India. Neurol India 2009;13:734-8. Khalap NV, Joshi VP, Ladiwalla U, Khadilkar SV, Mahajan SK. A report on higher frequency of DMD gene deletion in the Indian subcontinent. Indian J Hum Genet 1997;13:117-20. Murugan S, Chandramohan A, Lakshmi BR. Use of multiplex ligation-dependent probe amplification (MLPA) for Duchenne muscular dystrophy (DMD) gene mutation analysis. Indian J Med Res 2010;13:303-11. Verma PK, Dalal A, Mittal B, Phadke SR. Utility of MLPA in mutation analysis and carrier detection for Duchenne muscular dystrophy. Indian J Hum Genet 2012;13:91-4. Walton JN. Progressive muscular dystrophy and the myotonic disorders. In: Walton JN, editor. Disorders of voluntary muscle. 4th ed. Edinburgh, Scotland: Churchill Livingstone; 1981. p. 481-524. Rao MV, Sindhav GM, Mehta JJ. Duchenne/Becker muscular dystrophy: A report on clinical, biochemical, and genetic study in Gujarat population, India. Ann Indian Acad Neurol 2014;13:303-7. Kloepfer HW, Talley C. Autosomal recessive inheritance of Duchenne type muscular dystrophy. Ann Hum Genet 1958;13:138-43.